I am so in love with the pretty little shop Polka Dot Moon! Everything in the shop is so dreamy and lovely. The fabulous color combinations and pretty beads make me smile. Hello Friends, my name is Denise and I'm a mom, wife, blogger, friend, and the creative force behind Polka Dot Moon. 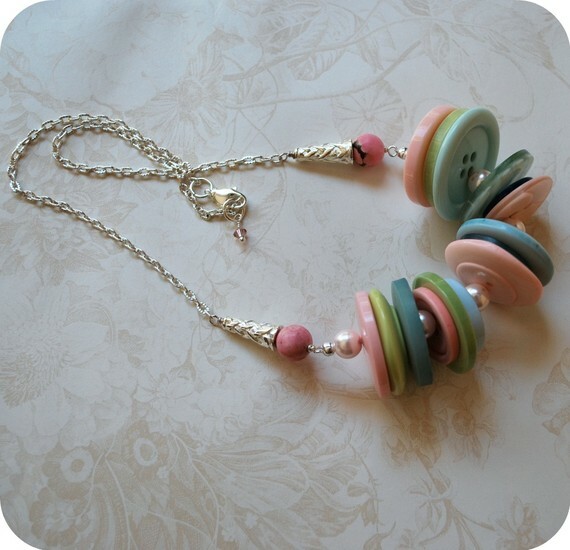 I enjoy creating whimsical and Vintage inspired pieces using all the things that I love to play with...Pretty beads, vintage trinkets, ribbon, glitter, paper and ink. See something you like, but maybe want a different color? Getting married? Need a special gift? I'm convo friendly and would love to make something special for you! Polka Dot Moon is giving away a $25 shop credit!!!! So you can pick some lovelies up for yourself or a friend. Visit Polka Dot Moon and leave a comment telling me TWO of your favorite things from the pretty shop. This GIVEAWAY will end on Tuesday, July 5th at midnight PST. i love the baby bloom earrings and the love bird bobby pins! I like the Weathered Leaf Earrings & the Love Bird Bobby Pins. I love the posy cuff bracelets. And the cottage rose and pearl drop necklace. 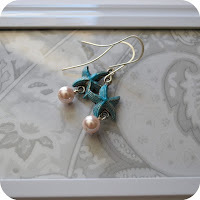 I am loving the cabbage rose - candy pink and turquoise and the pearls and pink lace earrings. Beautiful! I like Polka Dot Moon on facebook! Gosh. This is hard. Everything on her site is adorable. But I must say the Weathered Leaf Earrings and the Mocha Posy necklace did stand out...but so did the Posy Cuff Bracelet - Stormy Skies and the NEW- Sunset Posy Necklace in Antique Brass. What a fantabulous shop! 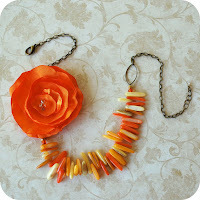 love the floating necklace in aqua and the ruffled peony necklace in mandarin! Love the mocha posey necklace! How unique! I love the ruffled peony necklace and the limoncello earings. I really love everything. Awesome stuff! I love the limoncello earrings and the cuckoo clock earrings! I love the floating necklace in aqua and the Ruffled Peony Bloom - Mandarin! I love the "Vintage Guilloche Yellow Flowers Filigree Ring" and the "Baby Blooms - 2 Pair Combo - Post Earrings". I love her stuff!!!! And I "like" her FB page!!!! I LOVE the antique floral necklace and the starfush earrings, and the leaf earrings, and... Nice job Denise!! !